Worldwide icon-chevron-right North America icon-chevron-right United States icon-chevron-right Illinois icon-chevron-right Chicago icon-chevron-right Chicago Pizza and Oven Grinder Co. Since 1972, this underground institution has been luring Chicagoans with the promise of famous sandwiches and pizzas. 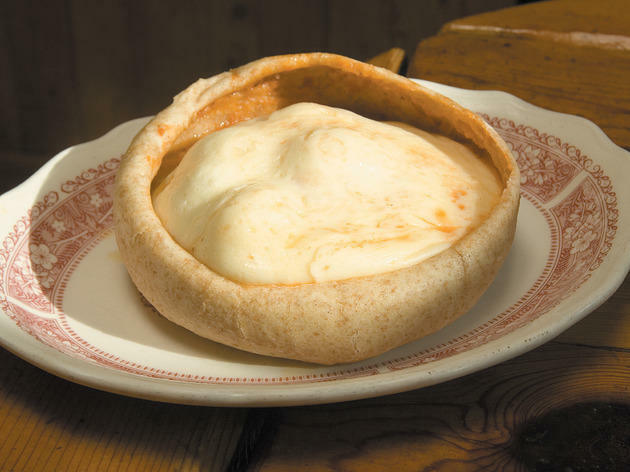 Its “Pizza Pot Pies” are in no way, shape or form actual pizza—they’re more like bread bowls filled with pizza sauce and melted cheese. But the grinders, such as the Italian combination that piles on Genoa salami and smoked ham, are so mammoth, crispy and warm, and the salads topple with such insane quantities of artichoke hearts, olives and peppers, that we’ll forgive the false advertising. Bus: 22, 36, 73, 151, 156. Eh, cool to go, nice thing to cross off your Chicago bucket list. It is nothing to complain about, but not sure it's worth the usual hour plus wait time. Mind you, this coming from someone who regularly waited in hour plus lines at Hot Doug's and Kumas, so let's be clear, there is definitely food worth waiting for, just not sure this is it. It's an experience, affordable, adorable, cool Chicago history. Service was incredibly hospitable minus the fact that it's cash only and they don't split checks. That definitely makes it slightly less welcoming. You also feel the urge of the staff to turn over tables. Good place to take out of town guests. Can't imagine it's a local hangout. I have absolutely no idea how their host remembers every single guest in the order that they came in because this place is a mob scene every time I drive by, and for good reason. This pot-pie style pizza is a truly unique, and cheesie experience that everyone should try. They have a very limited menu, so you know that its going to be good because this is basically all that they do. For the Pot-Pie's they come in either a half or whole pound option, white or wheat crust, and two filling options, Traditional which includes cheese, tomatoes, garlic, onions, peppers, sausage, whole button mushrooms, or the Vegetarian option which just removes the sausage. Just looking at this picture makes me drool! Prepare for a long wait, or go on a late weeknight (we went at 9pm) and enjoy a more relaxed atmosphere. 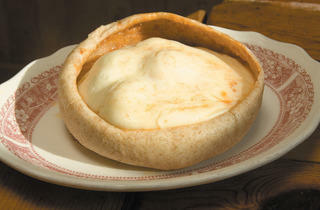 The pizza pot pie deserves every bit of hype that it received in the Food Network video. Don't forget the Mediterranean Bread! The salad was also big enough to share with another person. Give it a shot and enjoy! Pizza Pot Pie is amazing and unique! Make sure you get here early because there's always a wait. We waited over an hour at 3pm on a Sunday for two people. The guy doesn't take down names, so make sure you're there when it's your turn. There is a delicious bread there that I would recommend getting if you're with a group of people. Their pizza pot pies are unreal. Definitely get the mushrooms. I usually don't like them, but they tasted so good having been baked. This is my absolute favorite pizza in Chicago, maybe anywhere! I love the old school feel and the wait staff is so, so nice! I get a pizza pot pie at least once a month and it makes the wait SO worth it! I've lived in Chicago for a while and I can't believe I just heard about this place. I love the original ideas of the pizza pot pie and you have to try the Mediterranean bread. The spice combination on the bread is irresistible. The only downside is they don't take reservations so if you come with a larger party you might be waiting a while but in my opinion it is worth the wait! Near Chicago Pizza and Oven Grinder Co.